Queen Victoria still had two more decades to reign, the telephone and the gramophone were grating infants, Tchaikovsky's masterpiece Eugene Onegin was given its first performance in Moscow, and in Glasgow Mr McTear of St Rollox Chemical Works claimed to have made artificial diamonds. It was on an overcast Tuesday afternoon in 1879 when crowds of people, mostly on foot but a few of the more privileged in hired broughams and landaus, made their way up several steep, cobbled streets in the West End of Glasgow to attend what the Glasgow Herald called "a unique and attractive ceremony"
The event was the dedication of Garnethill Synagogue, the first synagogue to be built in Scotland and the only one for Glasgow's Jewish population of 700. One hundred years to the day later, on September 9, 1979, a 400-strong gathering of the great and the good gathered together for a Service of Thanksgiving to celebrate the centenary. Messages of congratulation were received from the Queen, Prime Minister Margaret Thatcher, Prime Minister Menachem Begin of Israel, the Chief Rabbi Dr (later Lord) Immanuel Jakobovits, and Jews from various parts of the world who had visited the synagogue. Other celebratory events were a banquet in the City Chambers, a "Jewish Way of Life Exhibition" in Hillhead Library, an exhibition of Jewish art in Glasgow's flagship museum at Kelvingrove, and two quizzes, one for schoolchildren and the other for adults. The handful of Jews who became Garnethill Hebrew Congregtion first gathered together for the purpose of communal worship in a rented room in High Street in 1825. In 1857 a flat in in George Street at John Street was converted into a synagogue and in 1875 the congregation resolved to buy a site and build a synagogue big enouigh to cater for the increasing population about 700 at the time . The total cost was £14,000. The new synagogue was described as ornate and attractive. The architect was Mr John McLeod of Hope Street, Glasgow, and the style of architecture he chose was "Romanesque with a Byzantine feeling introduced in the detail." The dedication ceremony was performed by Dr Herman Adler who later followed his father into the office of Chief Rabbi of Britain and the Commonwealth. Glasgow wasn't the first place in Scotland to have a Jewish community, even if Glaswegians tend to make more noise about their tolerance and hospitable nature. The first Jew in Scotland is mentioned in the minutes of Edinburgh town council on September 1, 1665. Regrettably he sought permission to convert to Christianity so that he could stay and work in the town. The earliest record of a Jewish settler in Glasgow relates to Mr Isaac Cohen who was admitted a Freeman of the City. He was credited with having introuduced the silk hat to Scotland. Certain office bearers in synagogue still wear one for services. The congregation of Garnethill has done a great deal more than merely survive for so many decades. 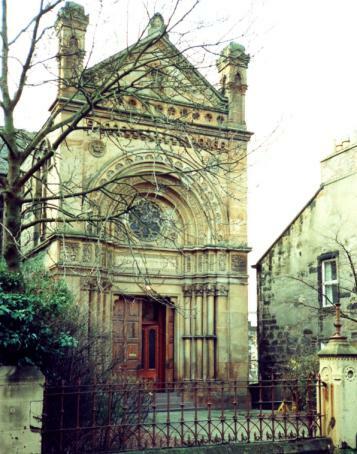 A large number of Jewish welfare, educational, charitable and religious organisations in the city owe their existence to the men and women of Garnethill. They helped to form what became the Jewish Welfare Board for many years and is now Jewish Care, the biggest organisation of its kind in Scotland. The masonic lodge Montefiore sprang from a meeting in the synagogue in 1887 and is still going strong. .
As the new century dawned ladies of the congregation started a miniature health service under the name of the Dorcas Welfare Clinic in Abbotsford Place, Gorbals. Garnethill has had seven ministers in its 122 years. The first was the Rev. E P Phillips, who served for half a century , but perhaps its best known minister was The Rev Dr I K Cosgrove who reigned - it's the only word to de scribe his term of office - from 1953 until his death in 1973. Kenneth Cosgrove was a small man in stature amd a colossus in enthusiasm and energy. He wrought miracles in the improvement of relationships between Jews and non-Jews, in education, in providing kosher meals for Jewish school children so that they did not have to trangress the dictates of their dietary laws while they were away from home, in the visiting of the sick, in fighting for better conditions for the mentally handicapped, and in ministering to the few Jews who occasional spent some of their less productive time in H.M. Prisons. And if that were not enough, he was Senior Jewish Chaplain to the Armed Forces in Scotland during the 1939-45 war. Garnethill's seventh spiritual leader is Aharon Soudry, a lay reader with a deep knowledge of the ways of Judaism acquired through diligent self-study and encouragement from his parents. He is also a Bachelor of Science graduate (in biology) of the Hebrew University in Jerusalem, where he met his wife Rosalie. She is a science graduate (zoology) of Glasgow University. Soudry was born in Morocco to a family who combined orthodox Rabbinics and business, a lifestyle he has perpetuated. He and Glasgow-born Rosalie run the family wine business.